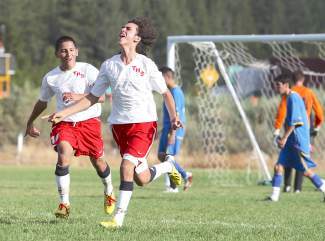 Truckee's Manuel Sarabia, right, and David Martinez celebrate a goal during a home game against South Tahoe last season. Both players return for the Wolverines. 9/3	vs. Incline	5 p.m.
9/4	vs. Spanish Springs	3 p.m.
9/9	vs. South Tahoe	5 p.m.
9/11	vs. Dayton	5 p.m.
9/12	vs. Elko	5 p.m.
9/13	vs. Spring Creek	12 p.m.
9/16	vs. Fallon	5 p.m.
9/20	at Lowry	12 p.m.
9/23	at Fernley	7 p.m.
10/1	at Incline	6 p.m.
10/3	at Sparks	4 p.m.
10/4	vs. Lowry	12 p.m.
10/8	at North Tahoe	6 p.m.
10/11	at Fallon	12 p.m.
10/17	at South Tahoe	4 p.m.
10/18	at Dayton	6 p.m.
10/27	vs. Fernley	4 p.m.
10/31	at Elko	4 p.m.
11/1	at Spring Creek	12 p.m. Given its lofty standards, five years without a state championship is a significant drought for the Truckee boys soccer team. The Wolverines — owners of an NIAA record seven state championships — last brought home a title in 2008. They’ve played deep into the postseason every year since, only to come up just shy of their goal. Eberhardt thinks this year’s group has the talent and experience to return to the top. Despite losing six seniors to graduation — including first-team All-League players Rolando Zarate (forward) and Max Barta (fullback) and second-team All-Leaguer Armando Diaz (fullback) — Truckee has eight seniors and returns key players at every position. “We should be pretty strong this year. Some of our seniors from last year were pivotal, but we have new kids coming in, and a lot of the newcomers were called up to varsity last year, so they got some experience,” Eberhardt said. Senior midfielder Thomas Arnstein and junior goalie Gabby Serna lead the way after receiving first-team All-League honors last season, while sophomore forward Manuel Sarabia and senior midfielders Jordan Fereira and David Martinez are back after second-team All-League seasons. Defender Leo Villa, who received All-League honorable mention in 2013, adds senior leadership along with Nick Oberriter (fullback), Nathan Ariza (midfield) and Jake Lahr (midfield, fullback). Forward Andreas Garcia, who did not play last season, rounds out the group of seniors. Other newcomers include sophomore defenders Zach Williams, Steven Alexis Lopez and Oscar Iniguez, who also plays midfield, as well as junior midfielder Hunter Simpson. Eberhardt said several of the underclassmen were called up to varsity for the postseason last year. Eberhardt expects the Wolverines to boast a well-rounded and potent offensive attack, with Sarabia and Arnstein showing a nose for the goal and junior forward Alex Colomenares Lopez returning after a solid sophomore season. “I see a lot of opportunities coming from out wide as well as playing it through the middle. I’m pretty excited with who we have at forward and midfield. We have a lot of speed this year,” Eberhardt said, adding that the Wolverines are adept at possessing the ball and are fundamentally sound across the board. If there’s one thing the Wolverines lack, it’s height, Eberhardt said. “But we seem to do fine with that,” he added. As far as Truckee’s Northern Division I-A, Eberhardt said that Sparks, which has become a perennial contender and the Wolverines’ primary rival over the past five years, should once again field a skilled team, despite losing league MVP Ruben Pacheco to graduation. Southern Division I-A power SECTA (Southeast Career Technical Academy) remains the team to beat, however, as the Roadrunners enter the season as two-time defending state champs. SECTA eliminated Sparks in last year’s state semifinal round before earning its second straight title by a 4-1 margin over Sunrise Mountain, which eliminated Truckee, 2-1, in their semifinal. To prepare for the tough tests ahead, Eberhardt said he scheduled more regular-season games against quality opponents, including traditional rivals Incline, the defending Division III state champs, and DIII state runner-up North Tahoe. After scrimmaging North Valleys at home on Wednesday, the Wolverines will open the season against four large schools at the Galena Tournament on Friday and Saturday — Faith Lutheran, Bishop Gorman, North Valleys and Reed.